The iPod Nano 6G is a device that once again, strayed well away from the traditional iPod Nano design. 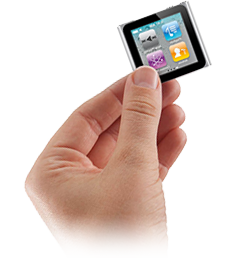 The iPod Nano 6G is actually a large boxy structure that is just a screen. It has no wheel like the previous iPod Nano's, it is entirely an LCD touchscreen. It's a very cool device, but because the screen is so large, repairs are commonly needed. We provide LCD screen repair services for the iPod Nano 6G and we ensure that it is done to a professional standard so that it will look just like the real thing. We also provide free diagnostic and repair services, so if you need your iPod Nano 6G to get inspected, you can send them free of charge and we will take a look at it and let you know what is wrong with it. Select this repair service if you have broken or damaged both the touch screen and the internal lcd screen. Not sure of the problem with your iPod - book it in for an inspection and send it in for us to diagnose and respond. One of our Engineers will check your handset and send you a quote via email- if your happy with the quote we will fix it and if not you only pay the diagnostic fee and return postage.